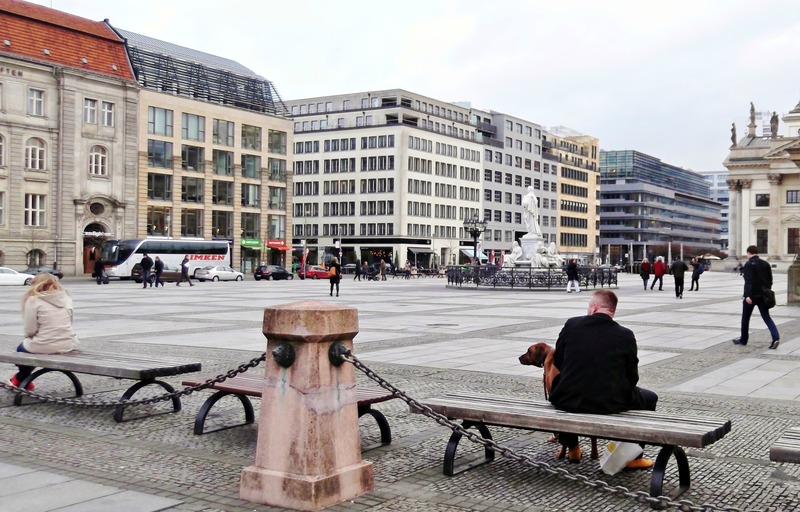 This time I’d like to introduce you to some well-known squares in Germany’s capital. All of them are known for a reason, be it due to historical notoriety or literary fame, or just because they’re beautiful. They all represent fragments of Berlin’s identity, and are thus worth a visit. 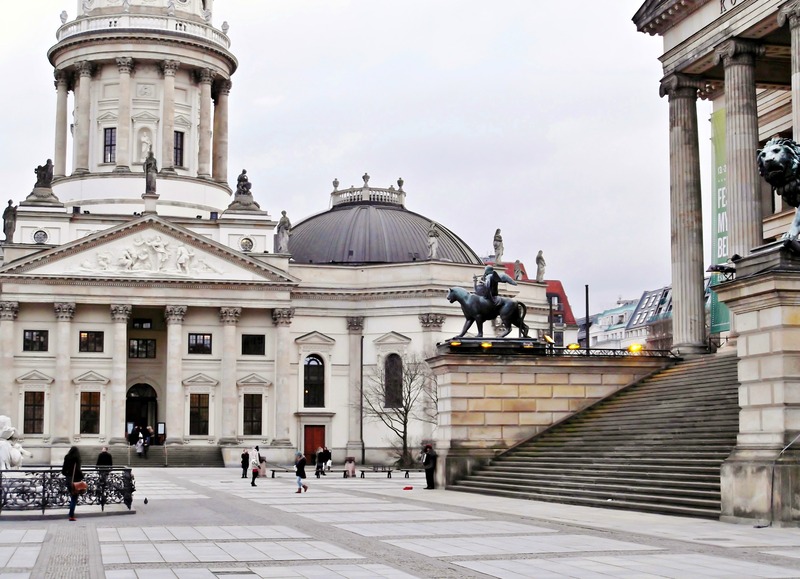 Gendarmenmarkt (Gendarmen Market) is said to be Berlin’s most beautiful square. This reputation might be mostly due to the fact that the square was a prestigious project of several Prussian kings, and throughout its history, had been home to national institutions and Berlin’s well-off citizens. 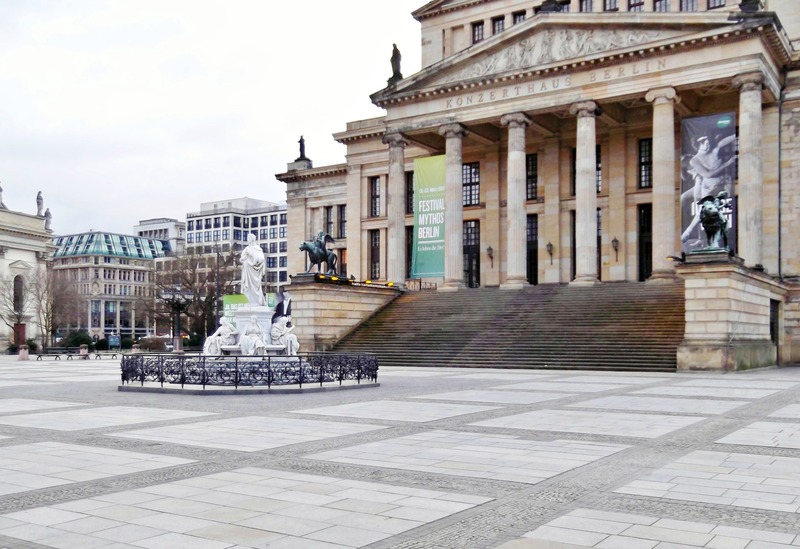 Gendarmenmarkt is situated in the Friedrichstadt neighborhood, a part of Berlin’s Mitte district. It is home to a concert hall, Konzerthaus Berlin, and two almost identical-looking cathedrals, the German Cathedral (Deutscher Dom), and the French Cathedral (Französiche Friedrichstadtkirche). 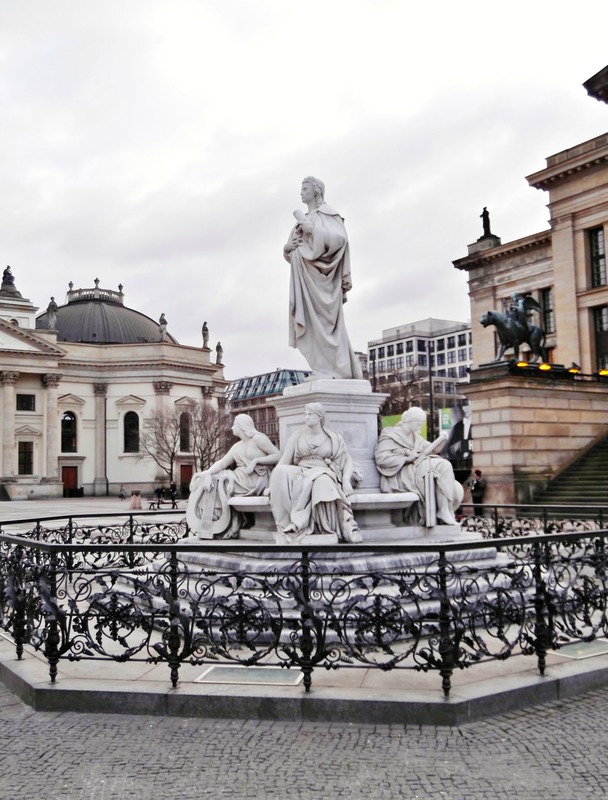 Besides, a sculptural group featuring Germany’s famous poet Friedrich Schiller is located on the square. The square was constructed from scratch by architect Johann Arnold Nering at the end of the 17th century, initiated by the Prince Elector Friedrich III, the later King Friedrich I of Prussia. At the time, it was mostly home to French immigrants, the Huguenots, who had fled persecution in France due to their protestant creed. King Friedrich I of Prussia granted both the German Lutheran and the French Protestant community a church of their own, the later German and French Cathedral. The French Cathedral was completed in 1705, the German Cathedral in 1708. At the end of the 18th century, the Gendarmenmarkt was reconstructed at the request of King Friedrich II (the Great): The two cathedrals got domed towers (architect: Carl von Gontard), and the square was surrounded by three-storey buildings. In 1799, the square got its present name – Gendarmenmarkt. It is named after a cuirassier regiment (Gens d’armes), which had their stables at the square until 1773. At the beginning of the 19th century, a theatre was built between the cathedrals (Nationaltheater by Carl Gotthard Langhans). Unfortunately, the Nationaltheater was destroyed by fire in 1817, and was then replaced by a new building in 1821 (architect: the renowned Karl Friedrich Schinkel). In 1871, a sculptural group of poet Friedrich Schiller along with four allegorical female figures was erected on the square (sculptor: Reinhold Begas). This sculpture is interesting, as it was subject to some of Germany’s historical transformations: In 1936, during the reign of the Nazis, it was dismantled and stored, because the Nazis wanted to use the whole width of the Gendarmenmarkt for propagandistic performances. After World War II, the Schiller statue had been set up again in the western part of the city, while the severely damaged allegorical figures were stored in communist East-Berlin. The single parts of the sculptural group couldn’t been reunited until 1986, when West-Germany agreed to extradite the missing female figurines to East-Berlin. Only in 1988, as Germany was still divided, the complete sculptural group was re-erected in its original place on Gendarmenmarkt. German Cathedral: No religious services are held here anymore. Instead, the building houses a permanent exhibition about the history of parliamentary democracy in Germany. French Cathedral: Religious services are still held here (in German and French). Besides, you can climb 254 steps in order to enjoy a viewing platform (recommended! ), and visit a Huguenot Museum. The Gendarmenmarkt is known for its beautiful Christmas Market in December. The Bebelplatz (Bebel Square) used to be a part of the so-called Forum Fridericianum, which was an architectural ensemble initiated by the Prussian King Friedrich II (the Great) in the second half of the 18th century, and was envisaged to constitute the new prestigious centerpiece of Berlin and even Prussia. Alte Königliche Bibliothek (Old Royal Library), on the right: Built between 1775 and 1786, it used to be home to the royal collection of books until 1914. Since then it has been part of Berlin’s Humboldt University, housing the Faculty of Law. The building has been nicknamed “Kommode” (chest of drawers) due to its curved shape. St. Hedwigskapelle (St. Hedwig’s Cathedral), with the turquoise dome: St. Hedwig’s Cathedral was built 1747 – 1773 by architect Georg Wenzeslaus von Knobelsdorff, and was the first Catholic church built in Prussia after the Reformation. The architectural role model was the Roman Pantheon in Rome. The cathedral is still the most important Catholic sacral building in Berlin. Deutsche Staatsoper (State Opera), on the left: Built between 1741 – 1743 by architect Georg Wenzeslaus von Knobelsdorff. The architectural role model here was La Villa Rotonda in Vicenza (Italy), which was designed by Andrea Palladio, the most famous Renaissance architect in Italy. The State Opera is currently under reconstruction and closed. But the actual reason why I visited this square in the first place was that it had been the location of the infamous Nazi Book Burning, an incident that happened during the darkest period of German history. 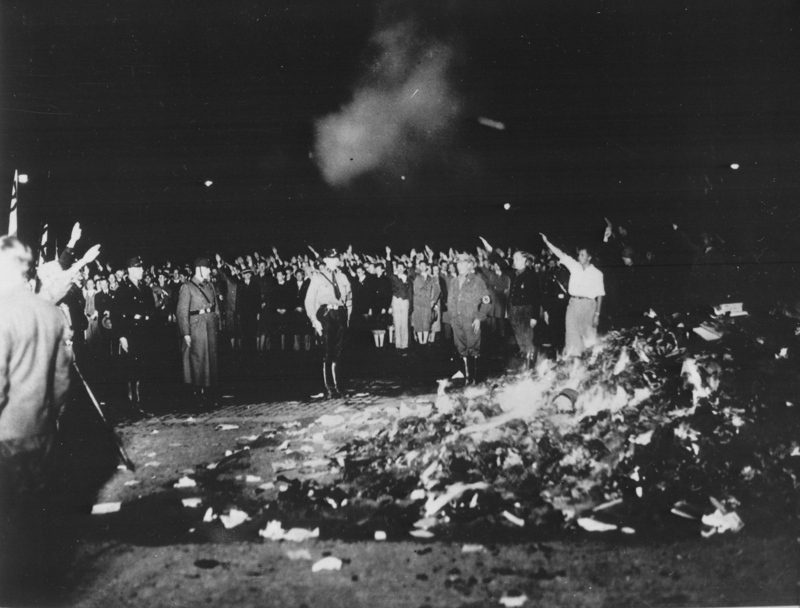 On the evening of May 10, 1933, the Opernplatz (today: Bebelplatz) in Berlin was the scene of a historic book burning, initiated and hosted by the nationalist German Student Association. It was part of a concerted action, arranged by the National Socialist government, taking place simultaneously in many German university cities. Nationwide, an “Action against the Un-German Spirit” had been proclaimed, targeting all literature and scientific writings which were perceived as detrimental to the German nation’s core values, or in other words, which didn’t seem to comply with the National Socialist ideology. And this list is only a small selection. Free access to knowledge and education has always been a thorn in the side of dictators and narrow minds, and book burnings have been a common means of intimidation and suppression throughout history. Yet as a German, the cultural crime and barbarism to which some of my favorite authors had been subjected, still leaves me speechless. 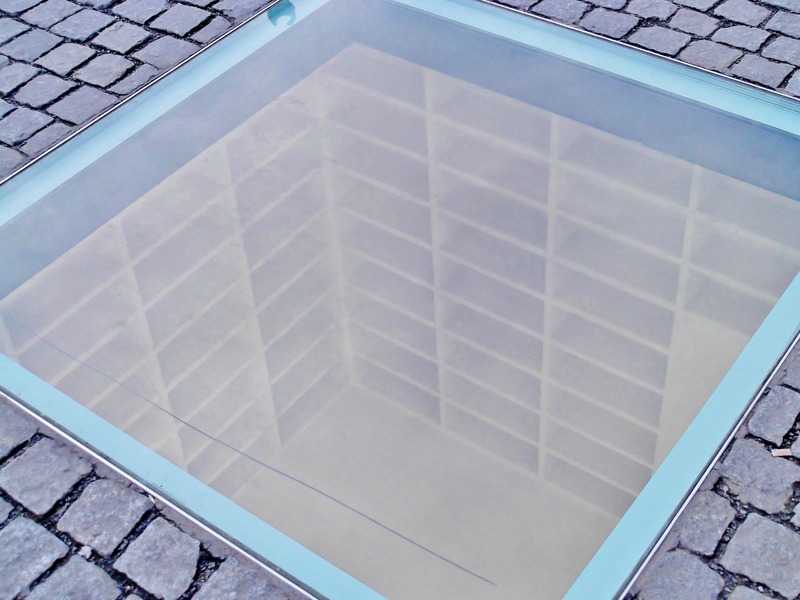 As a commemoration of the book burning, a memorial by Israeli artist Micha Ullman was set into the Bebelplatz. The memorial consists of a glass plate set into the cobbles, under which vacant bookshelves can be seen. It was inaugurated in 1995. The tragedy ‘Almansor’ is about the conflicts between Moors and Christians in medieval Spain, and the quote is a line spoken by the Moor Hassan regarding the burning of the Koran in the marketplace of Granada. 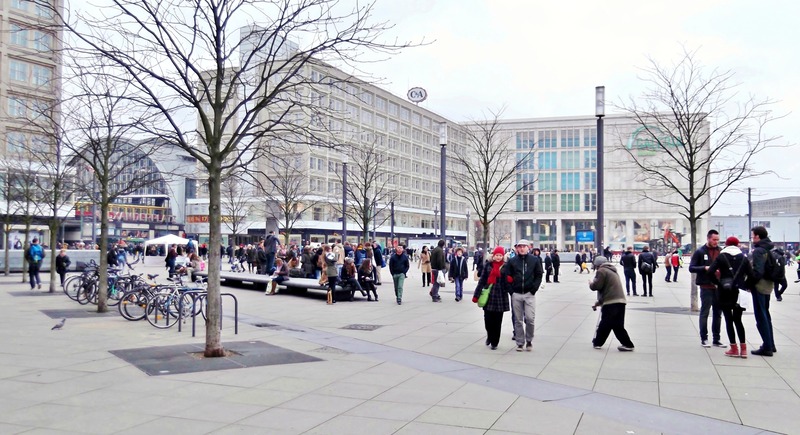 At first glance, Alexanderplatz (Alexander Square) is just a huge, bleak-looking square in the Berlin Mitte district. But wait, there is more to it than meets the eye. Alexanderplatz started out as a cattle market outside the city fortifications in the 17th century, but became a transport and commercial hub in the 19th century as a Stadtbahn (city railway, 1882) and a U-Bahn (underground railway, 1913) station were built. The square was named in honor of a visit of the Russian Emperor Alexander I to Berlin in 1805, but is nowadays affectionately called ‘Alex’ by Berliners. Its street bounderies are Grunerstrasse, Alexanderstrasse, Dircksenstrasse and Karl-Liebknecht-Strasse. As seen by many, Berlin rose to fame in the 1920s, during its ‘Golden Twenties’, which were at the same time the years of the Weimar Republic (1918/19 – 1933), Germany’s first attempt at democracy. The ‘Golden Twenties‘ were a dazzling era in Berlin’s history, marked by an unparalleled modernization in the fine arts, architecture, film and music. This period’s playful lust for life is legendary, even more so as it seems to be the exact opposite of Germany’s descent into darkness in 1933. Alexanderplatz was one of the epicenters of Berlin’s nightlife at the time, and it became an epitome of Berlin’s 1920s when it was portrayed in Alfred Döblin’s novel Berlin Alexanderplatz (1929). The novel has been later made into a mini-series by independent filmmaker Rainer Werner Fassbinder (1970). The swinging vibe of the Weimar Republic played a major role as well in the musical and film Cabaret (starring Liza Minnelli), which is an adaptation of Christopher Isherwood’s autobiographical novel Goodbye to Berlin (1939). Alexanderplatz was heavily destroyed in World War II, and was later partly reconstructed, being a part of the communist GDR (German Democratic Republic) after the war. The present architecture surrounding the square is a blend of socialist/modernist style, and entering Alexanderplatz one can’t help but feel a slight disappointment as no relics of its former glitz and glamour can be seen. That empty library is a powerful monument statement! Outstanding post!!! !… Berlin is certainly a beautiful city…. Thank you, and have a nice week too! Great idea to include the images from the past and compare it to current images. It’s amazing to see! Thanks for sharing this, I would love to visit Berlin again, and certainly with better guide information from your posts! Thank you, I really recommend going to Berlin, it’s beautiful now and so interesting! Are you planning to go to Europe soon? I love Germany because of cold weather and of course cars. And I think Germany is something for tourists specially for love birds. Germany is indeed a tourist destination that has much to offer. Yet I sometimes get a little desperate while trying to convince people to visit the northern regions of Germany more.